"Make taco night easy night with these slow cooker chicken taco bowls! Made naturally gluten free with homemade low-sodium taco seasoning and layered with fresh vegetables, this low-calorie dinner is one everyone will love, especially the cook! Assemble bowls, add optional toppings, and devour!" Combine onion powder, cumin, oregano, chili powder, and paprika together in a bowl to create taco seasoning. 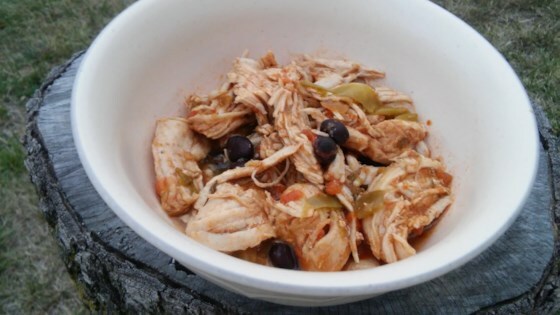 Place chicken breasts in the bottom of a slow cooker. Add green bell pepper, red bell pepper, salt, pepper, and taco seasoning. Pour in broth, ensuring chicken is just covered in liquid. Set slow cooker to Low; cook for 6 hours. Break up chicken breasts with a wooden spoon. Add beans; cook on Low for 30 minutes more.